My friends' 3 year-old son, Noah, has been asking me to bake him a lemon tart. So today, I made it my priority to do just that. I wanted to try a new recipe so I went to smitten kitchen where I can always find something not only delicious, but also kitchen-tested. 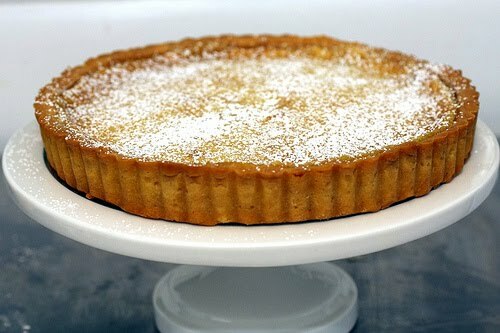 Her Whole Lemon Tart recipe is loosely inspired from the Parisian pastry shop, Rollet-Pradier. I finished my evening with a slice and the balance of flavors was perrrrfect... creamy smooth with just the right amount of sweet and sour. And the tart shell recipe is one of the best I've ever come across. It kept its shape and tasted great! Center a rack in the oven and preheat the oven 350ºF. Slice the lemon into thin wheels, remove any seeds, and toss the rounds (flesh and peel) into a food processor with the sugar and butter chunks. Process until the lemon is thoroughly pureed. Add the eggs, cornstarch, and salt and pulse until the batter is smooth. Pour into prepared tart shell. There may be excess batter, do not pour it past the top of your crust. Place the tart shell on a baking sheet to catch any spills. Bake for 35 to 40 minutes or until the filling is set. There should be a slight jiggle, may brown lightly on top. Let cool on rack, remove from mold, and serve. Dust with confectioner's sugar. You may prefer this tart chilled. Pulse the flour, sugar, and salt together in a food processor. Scatter the butter pieces over the dry ingredients and pulse until the butter is coarsely cut in. Stir egg to break the yolk. Add it a little at a time, pulsing after each addition. When the egg is in, process in long pulses - 10 seconds each - until the dough forms clumps and curds. Turn the dough out onto a work space with and with little handling as possible form into a disk. Wrap in plastic and chill for about 2 hours before rolling. Roll chilled dough into a 12-inch round, and place in tart pan with a 1/2-inch overhang. Fold overhang in, making double-thick sides. Pierce crust all over with fork. Freeze the crust for at least 30 minutes or longer, before baking. For a parbaked crust, preheat the oven 375ºF. Butter shiny side of aluminum foil and fit, butter side down, tightly against the crust. Since the crust is frozen there is no need to add pie weights. Put the tart pan on a a baking sheet and bake on center rack for 20 to 25 minutes. Carefully remove the foil. If the crust has puffed, press down on it gently with the back of a spoon. Bake the crust another 10 minutes, or until it is firm and golden brown. Transfer the pan to a rack and cool crust to room temperature, and proceed with the rest of the recipe.